Welcome to the website of new Pension Martin *** - accommodation Janské Lázně - Černá hora. Pension Martin offers accommodation of hotel type with relax pool and salt cave in nice and clean rooms. 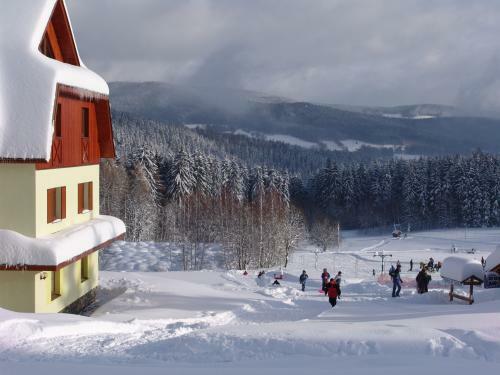 Stay in the beautiful landscape of the Giant Mountains near the center (400 m) of Jánské Lázně. in the Giant Mountains in spa resort of Jánské Lázně and at the same time very close to skiareal ski area SKIARENA Černá hora. Pension is situated very close to the slopes and lifts (the nearest is 20m with links to all ski lifts and cable car). Guest House - hotel is located in an attractive place by bike paths and hiking trails, in the centre of popular medical spa with many restaurants, dance evenings, concerts, discos, etc. It has very good location for hikers and cyclists. The center of Jánské Lázně with its spa colonnade is approximately 400m from the object. accommodation in attractive rooms with possibility of extra bed - 2, 3, 4 and 5 beds or apartment with kitchen (4 and 5 beds), common kitchinette available!, TV, satellite, internet, WC, bathroom, some rooms can be booked as a suite with kitchinette. Indoor relax pool and a salt cave free of charge, rich buffet breakfast with drinks, homemade cakes. As the only pension in Janské lázně we offer accommodation with free access to indoor relax pool and salt cave. Giant Mountains, Černá hora and Jánské Lázně offer well-marked hiking trails. The town of Jánské Lázně is lined by bike paths. In the vicinity of Černá hora there is wide range of sporting activities such as rope park, miniature golf, bobsleigh ... . Modern cableway Černohorský Express can take You to the top of Černá hora, from which there is a beautiful view of Sněžka. 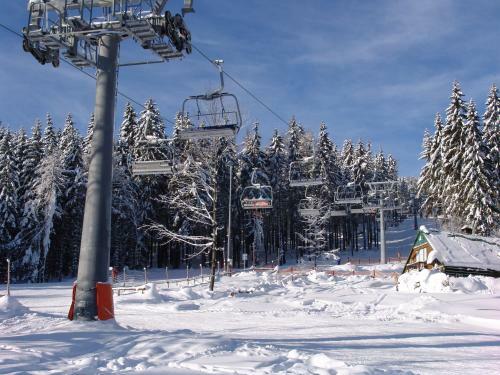 in winter You can enjoy ski resort SKIRESORT SKIARENA with lots of lifts directly nearby the house. You can enjoy massage and treatments in Spa Jánské Lázně. Walks in the surrounding countryside or to the centre of Janské Lázně are also enjoyable. Visit also colonnade in Jánské Lázně. How to book accommodation in Janské Lázně? tel: (+420) 731 495 600 or write to e-mail: rezervace@penzionmartin.cz. Jánské Lázně welcomes you! Pleasant stay in Pension Martin Janské Lázně!